I know only too well the thrill of finding an exciting small-cap stock set to soar. Indeed, we regularly talk about how fast-growing stocks can greatly improve your fortune. But there’s a flip side to that story. You can also find plenty of treasure in what many might see as a “plain vanilla” sector – provided that company is using high tech to shake things up. Right now, it generates more than $1 trillion in volume a year. And with home sales returning to prerecession levels, the staid and complex market for mortgages is ripe for disruption – and big gains for those who know where to look. That’s why today we’re using the five “rules” laid out in Your Tech Blueprint to turn up a great tech-centric play on this profitable dynamic. Just two weeks ago, I released my 2017 Legal Marijuana Forecast. Despite the many legal victories and the nice returns cannabis investing has already brought in the past year, it was a very bullish report. However, I’ve been hearing from some of you. You’re worried about the future of medicinal marijuana investing. First off, pretty much everyone paying attention has read or heard about attorney general nominee Jeff Sessions’ stated views on marijuana. They’re not progressive – to say the least. What’s more, many of you are now seeing legislative “pushback” in some state assemblies where voters voted “Yes” on legal marijuana use back on Nov. 8. In today’s report, we’ll figure out what’s really happening here – and then we’ll update that 2017 Legal Marijuana Forecast with these new facts. Lean in – I want to let you in on a little secret. Much of what the technology crowd – the media, marketers, analysts, etc. – tout to you as “disruptive” often isn’t. Many folks think of the cloud as a brand-new innovation. After all, the cloud didn’t really get much traction on Wall Street until five years or so ago. But really, the seeds for software-as-a-service (SaaS) were sown nearly 20 years ago. Back then, most folks logged onto the web using painfully slow dial-up connections – and so delivering and storing data and software on the internet couldn’t get much traction. Well, it’s getting traction now: According to IDC, SaaS spending alone will be worth $50.8 billion by the end of next year – and will surpass $112.8 billion by 2019. In other words, even though cloud computing got started back in the internet’s “Stone Age,” there’s still plenty of money to be made here – if you know where to look. Of course, you could invest in one of the cloud giants – say, Amazon.com Inc. (Nasdaq: AMZN) or Microsoft Corp. (Nasdaq: MSFT). But I like to dig deeper for you folks. That’s going to keep happening. Like many of you, I spent this morning glued to the television, watching the Inauguration Day festivities – and chaos. And I expect to spend some more time tomorrow checking out whatever protests are going on. But that’s it. No more distractions. After that, it’s back to following Rule No. 2 of Your Tech Wealth Blueprint – the five-part system we use to identify the companies best positioned to yield hefty profits… the ones we want to invest in. And one of the biggest tech trends going today has little to nothing to do with the presidential transition or the new administration’s goals – but it’s still unstoppable, and that means we need to keep watching it. I’m talking about the need for broadband wireless internet speeds … known in the industry as 5G. Today, I’ll not only show you why 5G is destined to become a vital Singularity Era technology that will change the way we work and live. I’ll also show you how the need for 5G speeds affects me personally – and millions of other Americans. Better yet, I’ll reveal a fast-growing, small-cap company that’s already playing an integral role in bringing 5G to “the masses”… and is poised to hand its shareholders market-crushing gains. Donald Trump promises to create 25 million new jobs over the next decade with his economic plan. And as we’ve been discussing over the past few weeks, I think that plan is a good one – and will be very good for tech companies and their investors. Robotics and artificial intelligence – “automation,” in a word – will eliminate tens of millions of jobs over that same stretch. How can anyone save or invest if they’re looking at a “jobless future”? One way to do it – to not just survive but to thrive in this unknowable future – is to profit from the very automation technologies that are threatening humanity’s livelihood. By any measure, 2016 was a great year – a watershed, in fact – for the tech- and pharma-heavy cannabis niche. For instance, ever since Sept. 2, when I sent my Nova-X Report subscribers the 30 pot stock recommendations in my “weed investors’ bible,” The Roadmap to Marijuana Millions, we’ve seen incredible gains all across the market sector. And what had been a phenomenal year got even better with a massive victory: On Nov. 8, voters in five states (five juicy untapped markets) voted to legalize medical and recreational marijuana. 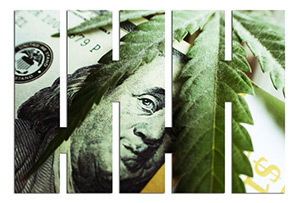 That boosted the cannabis niche’s growth prospects immensely. Remember, this is an investing arena that was already expected to grow by more than 31% a year until at least the early 2020s. But… the buoyant marijuana markets took notice when President-elect Donald Trump tapped U.S. Sen. Jeff Sessions (R-AL) to be the next U.S. Attorney General. The nation’s would-be top cop is known for his, shall we say, “retrograde” views on marijuana – legal and otherwise. That news cast a great deal of uncertainty on investments with an otherwise vertical trajectory. So, naturally, pot stock investors – and those considering it – are wondering what the future might hold for this high-growth, immensely profitable investing niche. Every company is a tech company. We came to realize this on Aug. 1, when the four most valuable companies in the Standard & Poor’s 500, for the first time ever, were all “pure” technology companies. That was the birth of the Singularity Era – with overlapping “rings” of technology, such as the cloud, mobile, chips, sensors, and software, all interconnected. We also believe here that the Road to Wealth Is Paved by Tech. And over the past few years, we’ve used dozens of tech stocks to build our wealth. Add those two “belief systems” together – and you might think you could blindly invest in the tech sector… and make your fortune. While I fully expect a strong rally for tech in the year ahead, we still need to select the best tech stocks in order to build true wealth. That’s our No. 1 job here, in fact: identifying the best tech stocks and funds – and then “playing” them correctly. That’s knowing which investments to avoid – the kind that Wall Street touts to you… with promises of getting rich quick… and that then rob you blind. I’ve got four of these “Tech Turkeys” today. The market has had a blistering run since Nov. 8 – with the Dow Jones Industrial Average up 9% — but plenty of the “experts” on Wall Street are pessimistic about Donald Trump’s effect on tech stocks. These folks believe that Trump’s tough trade stance will hurt tech because the big global players manufacture many of their products overseas. Gundlach may be the “Bond King” – but he’s wrong here about tech stocks. Technology will be the one sector of the economy you can count on for high growth in 2017. That may sound hard to believe, because tech slightly lagged the broader stock market through the first 11.5 months of 2016. But that was largely because life sciences fizzled. But tech stocks are going to resume their leadership position in 2017. Therefore, if you’re one of the millions of Americans trying to put together enough money for a stress-free retirement, technology is where your focus should be. In this wide-randing interview with Money Morning Executive Editor William Patalon III, I lay out my “case” for tech’s resurgence, talk about the surprising benefits incoming U.S. President Donald Trump will have on American innovators, and outline a strategy for maximizing high-tech profits in 2017.